03/12/2017, Sisters from El Caribe.- We have no words to explain about the visit of the General Government to our Province. The only way to express it is to say “THANK YOU” and then it is left to us to interiorize it. May it motivate us to be attentive to the Holy Spirit who ceaselessly speaks to us and invites us to journey...! We wish to say THANK YOU to Sisters Maria Escayola, Superior General, María Leonor Charria, María Fabiola Duque, Rosario Garcés and Diana Dolorita, General Councillors for these days of canonical visit which has been a time of grace for the Province. Their fraternal love, presence and simplicity have made an impression on each one of the Communities and the Missions that they visited. We live in the joy of having met them and shared with them our life, our dreams, concerns and hopes. 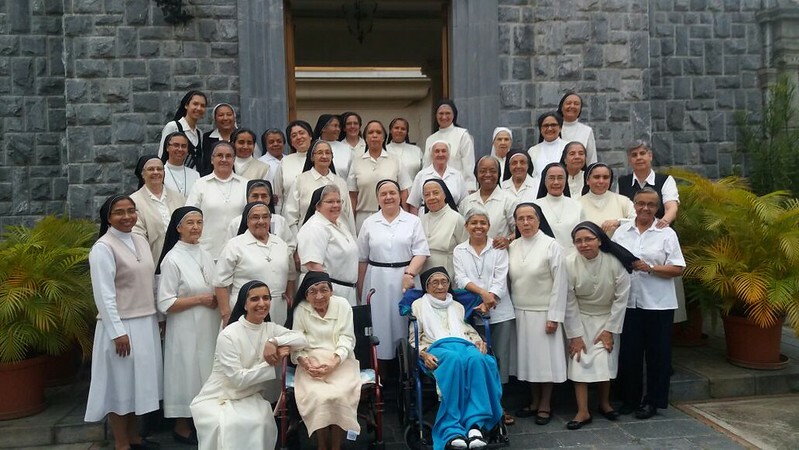 The last week was meant for meetings with the Provincial Government, the Superiors and for the Open Assembly with the participation of 40 Sisters in an atmosphere of fraternal love, reflection and discernment... there is a lot of hope. Of course, the difficulties that we live in our countries cannot rob us of neither the joy of our consecration or the challenge of Announcing the Gospel; it is a commitment for us to continue to discern ways to motivate us and respond to our mission and community life. Once again, THANK YOU Sisters for these wonderful weeks. By meeting each one of our Sisters in the General Government, we experienced the God of Life who always walks by the side of His people. May God bless you!